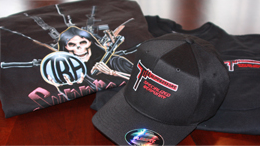 TBA Suppressors is always expanding our distributor network throughout the United States. If you don’t see a distributor near you on our site please send us an email and we will help locate one for you or assist with the purchase of your suppressor. The largest independently-owned hunting and fishing store on the East Coast. Forrest and Marlon Dance opened Dance’s Sporting Goods in 1976, in a small location in Petersburg, VA. Since 1947, Green Top has been Virginia's headquarters for fisherman, hunters, and recreational shooters located on Lakeridge Parkway in Ashland, Virginia. Western Hanover Virginia gun store carrying handguns, rifles, shotguns, ammunition and an assortment of other shooting sport related items. We specialize in Class 3 firearms, including machine guns, silencers, short barreled rifles & shotguns, and any other weapons (AOW's), as well as semi-auto rifles and handguns. Sterling Arsenal Custom Shop is a certified and authorized Sig Sauer and Glock Armorer and provides gunsmith - armorer and certified cerakote services for 1911, AR-15, AK-47, bolt-actions, shotgun, other firearm platforms at reasonable standardized rates.